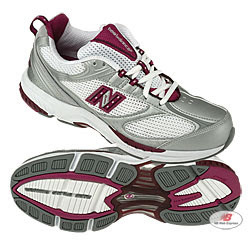 For someone who typically purchases running shoes, it is hard to find a walking shoe you really really like. The New Balance 759 arrived on our site a few weeks back and it's a great looking shoe that performs as well as it coordinates with outfits. It's also featured in the November 2007 issue of Woman's Day magazine, they feature it as an example of a great fitness walking shoe. N-Lock® midfoot support to keep the shoes snug and on your feet! You can view more information on the 759 while visiting our site. And don't forget the 759 is also a part of the Lace Up for the Cure® collection, so 15% of all wholesale sales will go to the Susan G. Komen for the Cure foundation, with a minimum donation of $500,000 and maximum donation of $1 million. Hi Cassie. I actually got hooked up with Pacer Jim through a friend of mine who had paced for him previously. He thought I had the personality and experience needed for pacing so he recommended me. I got contacted by Jim to fill out an application and then I got the call requesting pacing for San Fran. I know there are several pacer organizations around and you would probably just have to send them an email if you were interested. If you have a particular marathon in mind you would like to pace I would recommend checking out that races website and seeing if there is contact information for the person in charge of the pace group.